The 1100 Club began one January day back in 1985, following a Buyer's Guide in Practical Classics which painted a very negative picture of 1100s. The club's main goal was to keep the cars of its original members on the road and to provide new members with the advice and information needed to enable them to do the same. Membership enquiries came in thick and fast, and within three months of the first meeting there were 53 members and 63 cars. The Bromley Pageant of June 1985 was the club's first outdoor show, then as more members joined the idea of a National Rally was hit upon. The first such meet took place at Weston Park in September of that same year. and with members all over the world. 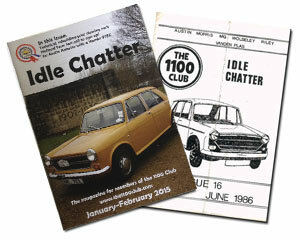 Six issues of the club's magazine, 'Idle Chatter', each year - a full colour, 44 page A4 sized paper publication (with PDF version) that has been highly commended at the Classic and Sports Car Club Awards at the NEC Classic Car Show for three years in a row before winning the award in 2018. It couldn't be easier: Join online or by post. You will get access to the website members area and a back issue of Idle Chatter, plus all the other benefits mentioned above.